When I started in recruitment 6 years User experience definition was in its infancy, not its the talk of the digital town but still to many and to my suprise some humans actually don't know what it is yet! So here's a share to the Beninners guide to UX research, hope it's useful. In an industry devoted to the people who use our products, services, and applications, research is paramount. We ask questions. We take notes. We learn everything we can about the target audience, and then iteratively test our work throughout the design process. UX research—or as it’s sometimes called, design research—serves many purposes throughout the design process. It helps us identify and prove or disprove our assumptions, find commonalities across our target audience members, and recognize their needs, goals, and mental models. Overall, research informs our work, improves our understanding, and validates our decisions. UX research encompasses a variety of investigative methods used to add context and insight to the design process. Unlike other sub-fields of UX, research did not develop out of some other field or fields. It merely translated from other forms of research. In other words, UX practitioners have borrowed many techniques from academics, scientists, market researchers, and others. However, there are still types of research that are fairly unique to the UX world. The main goal of design research is to inform the design process from the perspective of the end user. It is research that prevents us from designing for one user: ourselves. It’s fairly well accepted that the purpose of UX or user-centered design is to design with the end-user in mind, and it’s research that tells us who that person is, in what context they’ll use this product or service, and what they need from us. With that in mind, research has two parts: gathering data, and synthesizing that data in order to improve usability. At the start of the project, design research is focused on learning about project requirements from stakeholders, and learning about the needs and goals of the end users. Researchers will conduct interviews, collect surveys, observe prospects or current users, and review existing literature, data, or analytics. Then, iteratively throughout the design process, the research focus shifts to usability and sentiment. Researchers may conduct usability tests or A/B tests, interview users about the process, and generally test assumptions that will improve the designs. Young, Indi. 2008. 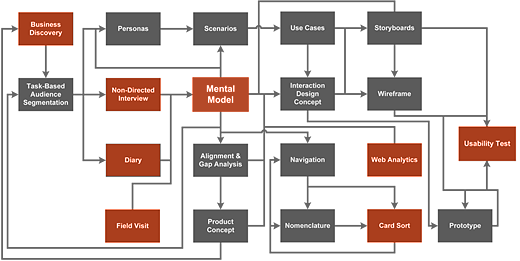 Mental Models: Aligning Design Strategy with Human Behavior. New York: Rosenfeld Media. We can also divide UX research methods into two camps: quantitative and qualitative. Quantitative research is any research that can be measured numerically. It answers questions such as “how many people clicked here” or “what percentage of users are able to find the call to action?” It’s valuable in understanding statistical likelihoods and what is happening on a site or in an app. Though researchers may specialize in specific types of interviews or tests, most are capable of conducting a wide variety of techniques. All researchers collect the valuable information that allows us to design in an informed, contextual, user-centered manner. The various types of UX research range from in-person interviews to unmoderated A/B tests (and everything in between), though they are consistent in that they all stem from the same key methodologies: observation, understanding, and analysis. The first step to conducting research is learning to observe the world around us. Much like beginning photographers, beginning researchers need to learn how to see. They need to notice nervous tics that may signal that their interviewees are stressed or uncertain, and pick up on seemingly minor references that may reflect long-held beliefs or thoughts that should be further probed. Observation may seem like a simple skill, but it can be clouded by unconscious biases—which everyone has. Design researchers train themselves to observe and take notes so that they can later find patterns across seemingly diverse groups of people. Much like observation, understanding is something we do all the time in our daily lives. We strive to understand our coworkers, our families, and our friends, often trying to grasp a point of contention or an unfamiliar concept. But for UX researchers, understanding has less to do with disagreements, and more to do with mental models. A mental model is the image that someone has in their mind when they think of a particular phrase or situation. For example, if someone owns an SUV, their mental model of “car” will likely differ from the mental model of the owner of a smart car. The mental model informs the decisions we make; in the case of the car owners, when asked “how long does it take to drive to Winnipeg,” their answers will vary based on the gas mileage their vehicles get, among other things. Design researchers need to understand the mental models of the people they interview or test, for two reasons. First, we all speak in shorthand at times. Researchers must recognize that shorthand based on the mental model of the speaker. Second, if the researcher can accurately identify the user’s mental model, he or she can share this information with the design team, and design to accommodate the model. Research on its own can be valuable, but in order to use the insights to inform design, it needs to be analyzed and ultimately presented to a larger team. Analysis is the process by which the researcher identifies patterns in the research, proposes possible rationale or solutions, and makes recommendations. Some analysis techniques include creating personas or scenarios, describing mental models, or providing charts and graphs that represent statistics and user behaviors. Although the techniques described here are focused predominantly on conducting research, it’s important to remember that research is only valuable if it is shared. It does no one any good when it’s locked away in a cabinet, or forgotten in the excitement of design.